Activated abilities of creatures you control cost 2 less to activate. This effect can’t reduce the amount of mana an ability costs to activate to less than one mana. T: The next time target creature adapts this turn, it adapts as though it had no +1/+1 counters on it. Surely This must be some combo enabler in modern. Oh joy, most likely the one card you need to make a simic deck work and it is in rare. 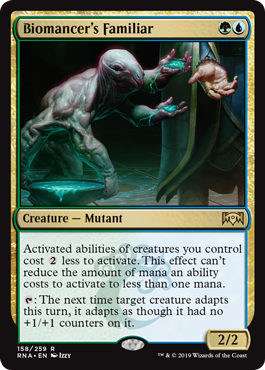 It's a shame this isn't a Thrull Mutant from the art, though. Don't forget about the adapt ability, it seems strong as it doesn't cost mana. This is going to share standard with Shapers of Nature for a while.